Prepared for the 2013 National Climate Assessment and a landmark study in terms of its breadth and depth of coverage, this report blends the contributions of 120 experts in climate science, economics, ecology, engineering, geography, hydrology, planning, resources management, and other disciplines to provide the most comprehensive, and understandable, analysis to date about climate and its effects on the people and landscapes of Arizona, California, Colorado, Nevada, New Mexico, and Utah—including the U.S.-Mexico border region and the lands of Native Nations. 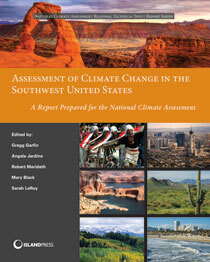 What is the climate of the Southwest like today? What has it been like in the past, and how is it projected to change over the 21st century? How will that affect water resources, ecosystems, agricultural production, energy supply and delivery, transportation, human health, and a host of other areas? How vulnerable is the region to climate change? What else do we need to know about it, and how can we limit its adverse effects? In addressing these and other questions, the book offers decision makers and stakeholders a substantial basis from which to make informed choices that will affect the well-being of the region’s inhabitants in the decades to come.